NIA CHARLESTOWN NEVIS (October 25, 2016) — The Dore Brothers of Gingerland were presented with individual tokens of appreciation by Premier of Nevis Hon. Vance Amory, for their exceptional contribution to music on Nevis. The handing over took place at a brief ceremony at the St. Christopher and Nevis Social Security Board’s conference room at Pinney’s on October 25, 2016. Mr. Amory, commended brothers Allister, Wrenford and Lanny Dore for their accomplishments over the years. “I want to congratulate these three industrious, musically talented and clearly, wonderful singers, who have brought so much joy and happiness to all of us in Nevis and St. Kitts and elsewhere,” he said. Apart from concerts in Nevis and St. Kitts, the group has toured the United States of America and Canada, taking their exceptional talents overseas. 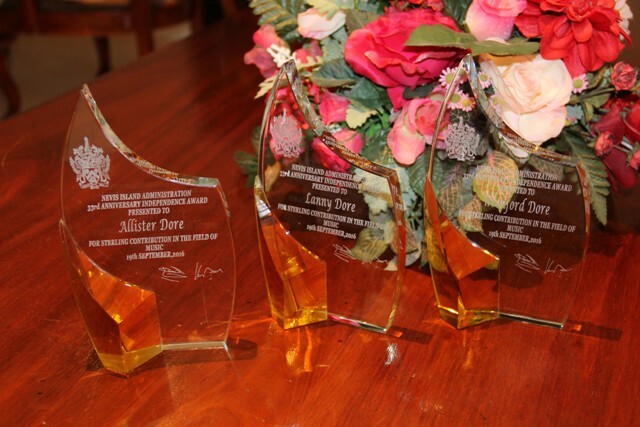 The presentation followed Mr. Amory’s announcement at the 33rd Independence Day Ceremonial Parade and Awards Ceremony at the Elquemedo T. Willett Park on September 19, 2016, that the Dore Brothers should receive individual awards instead of one for all three because of the high esteem in which they are held by the people of Nevis. 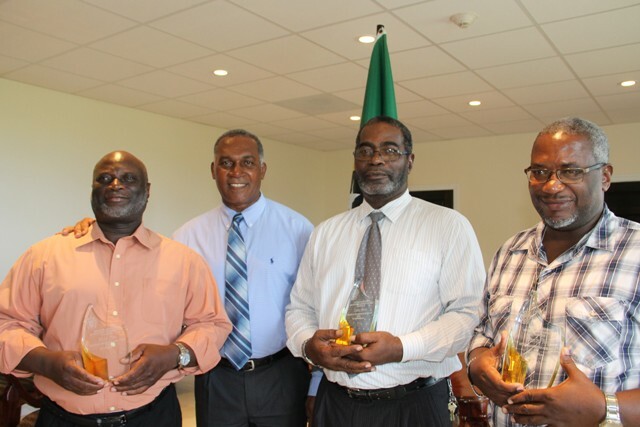 Along with six individuals, the Dore Brothers were awarded for their contribution to the development of Nevis during the 33rd Independence celebrations. Meantime, in response, Wrenford Dore thanked the Nevis Island Administration (NIA) for bestowing the honour on the group. He used the opportunity to extend the honour on others who have supported the group over the last 25 years. “We have had musicians who have accompanied us all these years but first, I should give thanks to God and to our mother, who has been very instrumental… in ensuring that the Dore Brothers not only sing but sing the gospel of Jesus Christ. “We’ve endeavoured to do that and with the help of people like Darren Sutton, Melbert Pemberton, Mervin Phillip and my son Lornell Dore and Mr. Abonati Liburd, Ms. Elvira Simmonds who has always been there for us, we would like to say that they are equally deserving of this honour and so, we want to thank them very much,” he said. Wrenford, also thanked the wider Nevis community for their continued support to the Dore Brothers. Also present at the ceremony was Assistant Permanent Secretary in the Premier’s Ministry Kevin Barrett.